ESI, Emergency Systems Inc. is a leader in commercial security systems for any application in today’s complex and ever-changing security environment. ESI provides and installs "keyless" entry systems needed to limit or track access to specific Commercial, as well as High-End Residential spaces. Before technology improvements, access control devices were mainly employed in high security applications where limited entry was guarded and warranted. Those systems had simple capabilities and the design was both ridged and costly. Times have changed and with the advent of more sophisticated and less expensive products, Access Control has taken on an entirely new meaning. 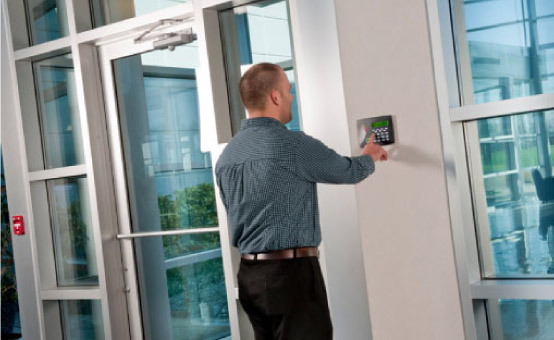 Today, Access Control allows any building, floor, room or any door opening, Keyless Entry using inventoried swipe cards or similar keyless devices. Access Control means simply that, access to enter is regulated by design, and restriction, and monitoring access is its chief purpose. Because of the widespread applications and acceptance of Keyless Entry Systems, more and more businesses who want to control access to their business or specific areas of their building, are installing access control systems. Security measures are important in protecting your assets, employees and customers and restricted access ensures peace of mind so businesses can run smoothly and intrusion free. ESI ‘s Access Control Systems are affordable protection, expertly designed and installed to meet any security need and budget. We utilize the latest technology including proximity cards and fobs, biometrics (finger print, eye scan, etc.) and wireless. Additional options include stand-alone electronic fixtures attached to a particular door or advanced fixed place keypads that are integrated into a complete security system. Installing an access control device gives you a complete freedom of choice as to who has access to all or part of the business facility. Restriction and monitoring access is its chief function but utilizing this type of advanced electronic security measure doesn’t stop there. We believe the most important security function available to any size business, is protecting its assets and people employed to make the business run efficiently. Robbery, theft and intrusion of any kind can disrupt a business’s day to day activities, and can impact a business’s bottom line. Today, most businesses take precautionary steps to protect themselves by putting locks on windows and doors throughout their facility. The security question for most business owners is that really enough protection and does potential loss and exposure exceed the cost of adding security measures like an access control device. The answer is yes. Key-less Entry Devices or Access Control, provide electronic protection while informing would-be intruder they are likely to encounter other layers of security protection employed to detect and thwart any attempt to gain unauthorized access to the facility. With the increase in workplace violence it is imperative to keep employees safe. Today, with the incidences of workplace & institutional violence, and the heightened security following the events of 9/11, the use of modern access control systems not only restrict the movement of individuals but also can track them thru out a facility and record each their activity in sensitive rooms or area. The advantages of not having to deal with lost or stolen keys plus the ability to instantly disable a persons ability to enter a facility is just a small benefit from having an access control system. In one instance, a customer reported that since we had installed the system on their housekeeping, janitorial & supply room the cost of supplies had dropped by $900.00 a month. Apparently, some employees were stocking their homes with business supplies. In another case, a warehouse business installed access control entry keypads on parking and other specific areas of a warehouse facility with tremendous success, allowing security guard expense to be reduced. Additional keypad entry devices were installed throughout the warehouse and motion detectors equipped with real time video feed surveillance, (Videofied) had enabled ESI’s monitoring station to report some verified alarms and police were dispatched. Intruders were apprehended on property and stolen items were recovered. Instances like these reduce the need to file insurance claims thus reducing overall expense. The likelihood of incidents like these are being reported every day and unfortunately the rise of illegal activity is making businesses consider more and more security measures to ensure workplace security.